Hey everyone! This article is a glossary about VoIP, prepared by NUACOM and will be updated on a monthly basis as soon as we develop new features or create new integrations for you. Please follow us on LinkedIn, Facebook or Twitter for more update notifications and new articles. And if you have a question about any terminology you read or heard but is not listed below, please do not hesitate to ask us in the comment field or send us your question to support@nuacom.ie. We’ll be more than happy to assist you, plus add your terminology to this list. Auto attendant means to receive all incoming call with a pre-defined set of messages and menu. Automated Call Rating is such system that enables users to evaluate the performance of each call or selective calls. Backup call feature in VoIP phoning system allows users to automatically transfer the call to a predefined number, mobile and landline in case of an emergency like out of electricity, out of Internet connectivity and such. Bandwidth refers to how fast your internet connection can transfer data. Usually, it measures in Megabits per second or Mbps. Bandwidth management is a process of managing traffic of an Internet connection to ensure quality in its usage. Bandwidth consumption refers to the consumption rate of bandwidth in an Internet connection. Call Barring refers to set restriction to certain types of call or number from being made. Call Blocking is an ability to block specific destinations or numbers so that no call can be made to that destination or numbers. In VoIP Phone system, call center functionality refers the functionalities which are available in a modern call center. Features like the welcome message, music/message on hold, automated call routing etc. are known as call center functionally. Call conferring means multiple people talking to each other simultaneously from their own phone just a like a conference. It can be standard 3-ways call conference or a conferencing room for more than 3 participants. A detailed report that includes source number, destination number, call duration, date, time and much more. All data are presentable in graphical form. Call Divert means to divert a call to others mobile number or landline number when the phone line is busy or unreachable. Call Encryption refers to encrypting the digital data to ensure the highest security which preserves the data from being published to the intruder. Call Forwarding means the ability to forward the call to other numbers or destination if necessary. Ability to group the call based on the department, skills, location, language or team for efficient handling. Detailed call record which includes duration, destination, origination, and price. You can see this call logs via our online portal. Call parking is an ability to park the call to another connection point. The connection point can be the situation at your office even in another room. Call Queuing means the ability to place the incoming call in a virtual queue. Ability to record all calls for future reference. The recording also can be used for judge the call center service quality. Call Transfer- Blind Step means the ability transfer calls to another extension with one single action. Call Transfer- Multi Steps means the ability to transfer the call with multiple steps. We can easily transfer the call with 3 steps-placing the caller on hold, requesting permission to the next receiver and transferring the call. Call waiting feature enables users to see a call while he/she is already engaged on another call. 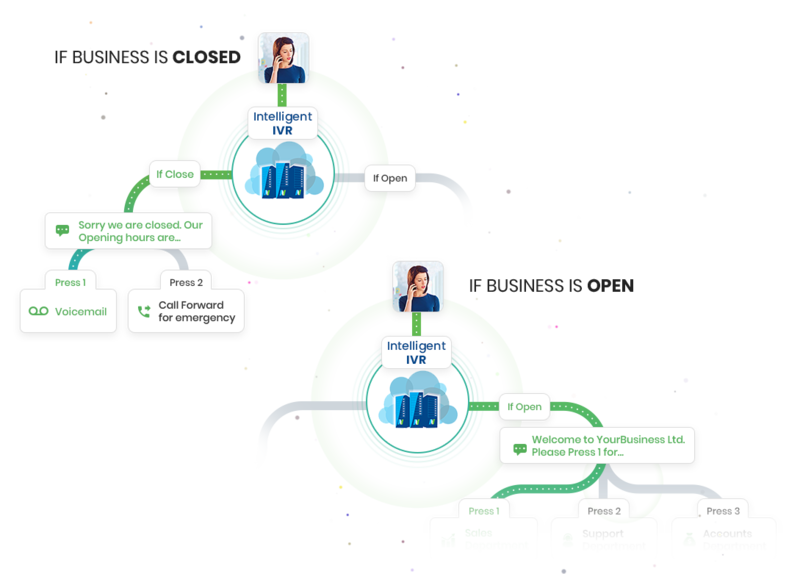 Call Whisper is a handy feature where businesses have multiple departments at the same location. The receiver will hear a pre-recorded message when an incoming call will arrive. The pre-recorded message will help the receiver to identify the department of the incoming call. Our application can be run on Chrome App platform which will enable you to run our online app as a desktop app. Custom Call ID enables business owners to set up specific numbers to make outgoing calls. The distinctive Ringtones is such a feature which allows business owner set distinct ringtones for each of the numbers on the same device. This is a convenient feature to identify which number is getting a call. Do Not Disturb is functionality which will allow you to not take any call when you need to pay attention to other tasks or not willing to receive a call. Ethernet is a network protocol to transfer data in a Local Area Network (LAN). The term Failover refers to a backup operation which is performed automatically if computer system, server, hardware fails. When your first system fails then the secondary system automatically take over the duty which is known as failover. Commonly used in a network to connect 2 or more type of internet connections. FAX-To-EMAIL feature allows users to receive FAX directly in email as a PDF attachment. Thus the user can avoid the cost of setting up the FAX machine. Firewall is such a system which ensures the security of the system by checking every incoming and outgoing data. The Gateway is network node which connects two networks with dissimilar protocols. While a bridge connects similar networks but gateway connects dissimilar networks. We provide HD Call Quality that means you can make conversation with other parties without any sort of distortion or noise. Hunt Groups refers to set up to ring one device at a time for a group of phones. We provide the ability to import your existing contact via our online interfaces to make sure you do not lose any contact. Ability to integrate your NUACOM account with third-party apps such as HubSpot, Pipedrive, Salesforce, MailChimp, Google Contact, OneDrive and much more. It’s a feature for every phone to have its own settings and numbers and ability to use a local number without international prefix. An Internet Protocol or IP address is a unique ID of a device so that it can connect to another computer in the computer network. Internet Service Provider or ISP means a company which provides the internet to customers to access the Internet. Interactive Voice Menu or IVR is modern VoIP feature that answered all calls automatically with an interactive voice menu. A Local Area Network is one type of computer network that covers small areas like home, hospital, institution and such. Our mobile app provides interactive options and features to manage your VoIP phoning from anywhere anytime. We provide a cheap package to call any mobile which will save up to 60% of your call cost. Multi-Location Deployment system allows the business owner to set up across all your office or location, with only one single Cloud Phone System. Music on Hold feature means the ability to playing a pre-recorded message or music while the caller is on hold. Music on Hold feature means the ability to play a pre-recorded message or music while the caller is transferring to other destination. While you are busy on another call the new incoming call can be placed in a queue, diverted to another line or just can be indicated to you as you speak on another call. Number porting feature allows you to use your existing number to use in our system. You do not need to change your existing number. Number-Name Indication feature means our system is capable showing the name and number if it already in your contact list. Our interactive online portal will enable you to manage call logs, Billing, Settings, Email Marketing, Contact Management, Live Reports and much more. This feature will enable you to set and opening hours for your business. When someone calls out of you opening time our system will inform the caller about the opening hours in a polite manner. You set up open/close times by logging into your account. A packet is a unit of data which transmit through the Internet from origin to source. Paging or Public Announcement is a feature which enables users to page staff in a warehouse or play scheduled advertisements over a speaker within your shop. Presence is an ability to see extensions status, such as offline, busy, ringing, available. Private Branch eXchange-PBX is a telecommunication device often used in business environments in order to connect office telephones as well as to route calls appropriately. The protocol is a set of rules between two or more parties to make a successful communication. Proxy means connecting to the internet via an intermediary server. The intermediary is known as a proxy server. Your request reaches to the proxy server and then the proxy server processes your request and serves you what you were looking for. This you can hide your identity. Public Switched Telephone Network (PSTN) refers to the collection of interconnected public telephone networks. You can provide public Wi-Fi to your customer directly from our system which will enable them to browse internet free when they’re on your premises. The quality of Service is an excellent method/tool to prioritize bandwidth for the application. It divided the bandwidth among the application smoothly. We provide real-time billing directly from our online portal. You can choose add-ons and plans as you grow from our portal. Session Initiation Protocol (SIP) is a VoIP telephony method which is also known as the predominant signaling method. Our system provides an easy and convenient way to host your SIM card on our system and route all the incoming and outgoing calls. It is a suitable feature for you if you have an office at a different location and you do business on the go. SIP Trunks Connection extends your VoIP telephony beyond your organization’s firewall. We do offer advance SMS System that includes a most modern feature like scheduling, reporting and a full set of options that will cover all your needs. It does not matter whether you are using PC, MAC or Mobile. Our system is always with you as Softphone. Our system allows you to setup shortcode for your most dialed numbers and saves time. Transmission Control Protocol/Internet Protocol (TCP/IP) is a basic set of rules of Internet to establish a connection between computers/networks. Transfer Bounce Back means if a transferred call is not answering after a certain number of rings, the call will be returned to the first receiver. Voice Mail is the dedicated location for people calling to leave a message. It stored the message for future references. Voice over Internet Protocol (VoIP) is modern technology where people can call using Internet connection rather than the Public Switched Telephone Network (PSTN). This feature emails the voicemails to predefined email automatically. Virtual Private Network (VPN) is a network technology that extends a private network across a public network. Play a Welcome Message when an incoming call is received and greet professionally your customer. Wireless Fidelity or Wi-Fi is a network technology uses radio waves to provide wireless high-speed Internet.